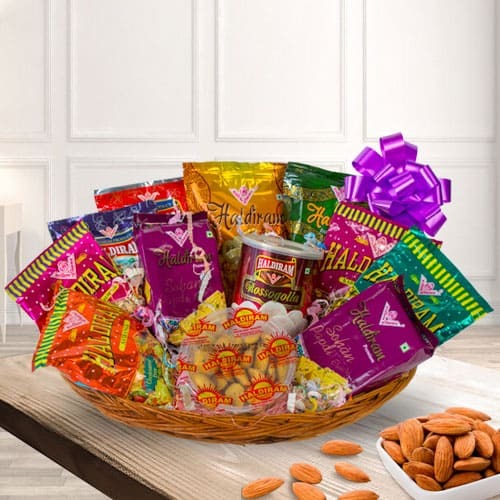 Amaze your loved ones by gifting them this Energetic Take Your Pick Assortments Gift Hamper and make them crave for more. Make your recipients delighted by presenting them this Hamper that contains Haldirams Badam Pakori, Methi Mathari, Khasta Mixture, Kabli Chana, Plain Bhujia, Kashmiri Dalmoth, Moong Dal, Chana Dal, Satranga Masala Mixture, 2 Haldirams Soan Papri 200 grams and Haldirams Rasgulla 1 kg. These Items are nicely presented in a decorated Tray.